Immunize Nevada is a “coalition of individual, business and organization partners committed to improving and protecting the health of children, teens, adults & seniors in Nevada,” according to its website. 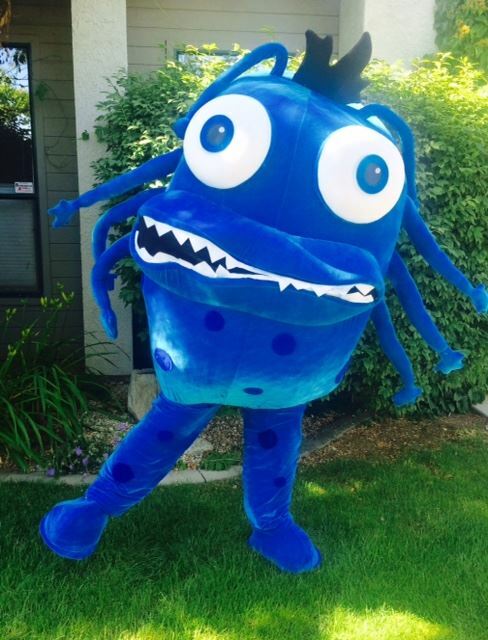 A friend of mine on Facebook who works for the advertising agency handling Immunize Nevada, posted a picture of the blue germ above and offered a $25 Amazon gift card to whoever came up with the best name for this mascot, who will appear in videos and promotional materials. I saw some of the entries on Facebook and, while very clever, were incredibly long or too tied into other well-known intellectual properties. I came up with Infecto, which won, I believe because of its simplicity. I’m happy to help out. So what did I spend my $25 Amazon gift card on? I picked up Shout Factory‘s excellent blu-rays of Escape from New York and the Roger Corman “classic” Death Race 2000. © Paul George and The Reno Signal, 2015. Unauthorized use and/or duplication of this material without express and written permission from this blog’s author and/or owner is strictly prohibited. Excerpts and links may be used, provided that full and clear credit is given to Paul George and The Reno Signal with appropriate and specific direction to the original content.